Vero Beach woman was arrested at a McDonald's after she spit, kicked, and punched the restaurant manager. VERO BEACH – A woman was arrested at a Vero Beach McDonald’s after she began kicking and spitting on the restaurant manager because of their service, according to the Indian River County Sheriff’s Office. 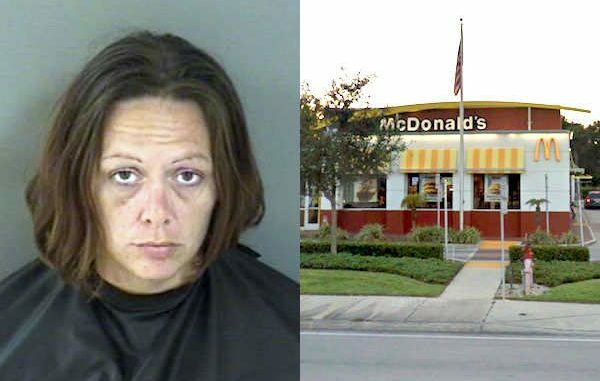 Sheena Marie Collett, 33, entered the McDonald’s located at 1925 U.S. Highway 1 in Vero Beach and disrupted the restaurant. “Video taken by a witness at the scene … showed a white female subject wearing a lime green shirt and red pants. She can be seen yelling at workers in the restaurant and dumping a bag of food on the floor,” the deputy said. As the video continues, Collett can be seen kicking, punching and hitting the McDonald’s manager, according to the report. Another witness said she saw Collett spit on the manager multiple times. Collett was then seen pushing over and breaking a glass food display case which was valued at $200.61. On top of that, Collett then knocked over a computerized register valued at $15,000 before leaving the store. Collett was later arrested in Vero Beach and transported to the Indian River County Jail where she was charged with Battery, Criminal Mischief, and Disorderly Conduct.